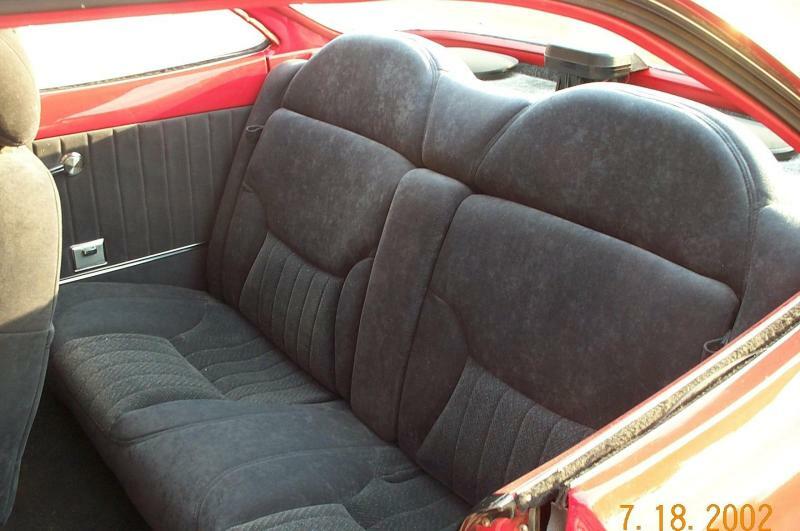 1995 Monte Carlo Seats into a Corvair. 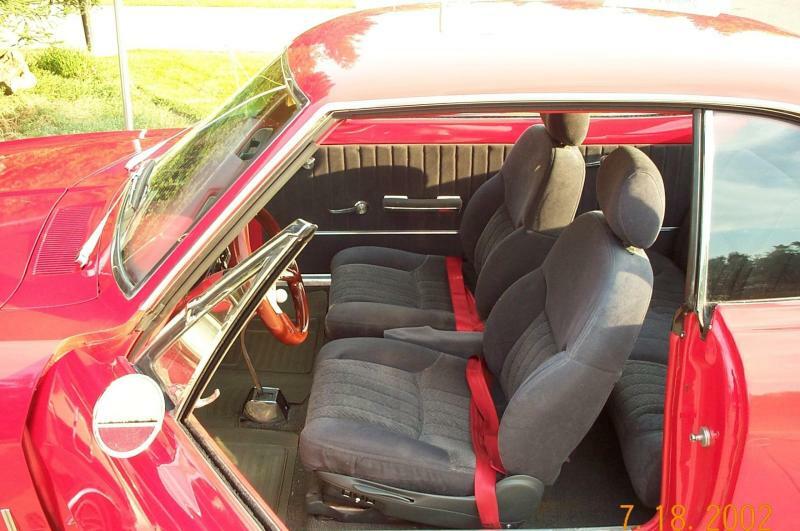 Jim Briggs did an install of 1995 Monte Carlo seats into his '65 Monza, resulting in a nice clean interior that should function better in every way over stock. Although adapting any given set of seats to the Corvair will have some detail differences, overall the process is about the same. The front seats are not a direct bolt in as some would like. However they fit with minimal to moderate fabrication... depending on how you want to procede. Tip #1 when purchasing the interior from a parts yard - get all the original mounting bolts, these are a neat fine thread/self threading 5/16ths 12 point head screw. The small head fit into the seat tracks and while you won't need them for all the attachment points they are a big help. 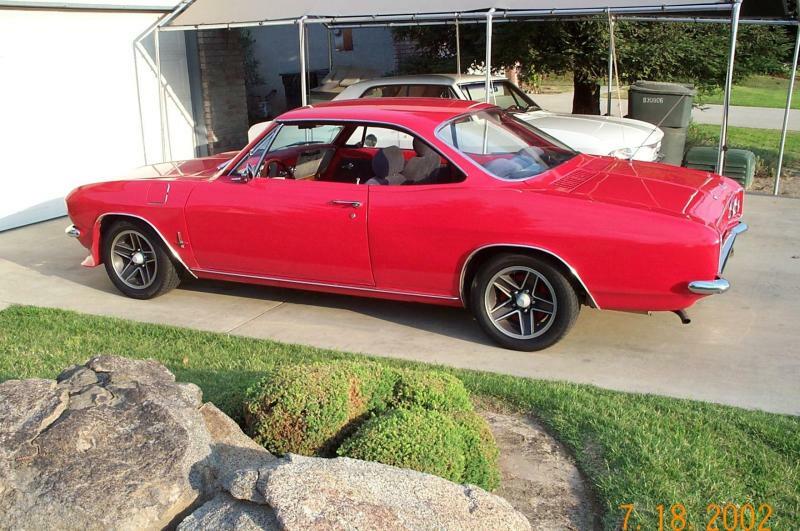 The seat's tracks are not quite the same width or length as the stock Corvair's. On the drivers bucket seat I drilled holes into the pads at the frontmost part of the tracks that lined up with the stock mount holes, removed the studs and bolted the tracks to the stock points. The rear of the tracks now line up short of the rear mounting point but all you have to do is to fabricate about a 2" hold down with a slight step in the middle to accomodate the back of the track with a hole on one end. Then bolt the hold down into the stock mount point and clamp down the back of the track. You may have to wedge under the back of the tracks in order to keep from flexing the tracks on the not quite flat floor. Flexing here can cause problems with the seat movement. On the passenger side I again drilled the (smaller on this side) front pads. Again, the widths are not quite the same so line the holes up carefully as it is easy to spread or pinch the width of the track enough to interfere with the seat movement. Here I used the Monte's bolts the thread into the stock holes (use a long 1/4 extension in an electric screwdriver with a 5/16" 12point socket) but be careful on the inside front as it can thread into the main wiring harness (don't ask me how I know this!) I ended up removing the bellypan and pulling the harness away from that area intil the bolt was placed. I was able to attach the rear of the inner track by drilling a new hole into the center of the track about 3/4 of an inch behind the original track mount hole to line up with the Corvair's mount and used a Monte bolt here also. The outer rear was a little tricky as it lines up about an inch inside the stock mount hole. Here I fabricated a two piece mount. One piece went under the track with just of an inner lip to grab the inside of the track. the other piece was shorter and laid on top of the outer lip of the track. Both of these pieces were drilled to line up with the stock mount point and bolted again with a Monte bolt. The rear seat back is relatively simple. My seats have fold downs for trunk access. In the upper/outer corners are plastic stops for the fold downs. For the upper attachment points simly drill through these stops into the Corvair crossbar, place an approximately 3/4" wood spacer between the stop and crossbar and use the monte bolts with washers to attach. The lower back attachments line up with the Corvair's subframe so simply attach with the Monte bolts and washers. The rear seat bottom is wider front to back than the stock seat bottom and requires a new attachment point. First I bent the Monte attachment tabs at the front bottom of the seat to be vertical instead of horizontal. Then with the Monte seat bottom in place I took a 2x6 and placed it under the seat onto the area where the stock seat meets the floorpan and lined it up with the bent down tabs ( with the seat bottom in position). I marked the 2x6 at the tabs and at the vertical portion of the pan. I used these markings to screw the now upholstered 2x6 to the floor pan ledge, then slid the seat into place and used the tabs as attachments for the seat bottom. That's about it for the seats. My wife and I custom upholstered a set of Clark's door panel blanks in matching cloth. I used a large piece of foam for the back shelf. This was ideal for sound deadening and easy to upholster and place the rear speakers in. Last update: 29 October 2008. Copyright Bryan Blackwell.